This month, we profile the Manufactured Housing Association of BC (MHABC), dedicated supporters since 2017. Executive Director of MHABC Gord Rattray recently shared his motivations for giving back. What started as a balloon pop fundraiser at the MHABC’s annual conference quickly became a passion for the MHABC members, who work to supply modern factory-built homes to families across BC. Moved by stories of families who needed to leave their homes in search of life-saving treatment, and who need a comfortable place to stay together, the MHABC decided to formalize support of Ronald McDonald House in 2017. Each quarter, the MHABC summarizes the number of homes that have been shipped in that quarter and multiplies that total by $5. 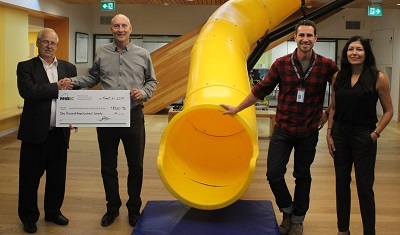 A cheque for that amount in the form of a donation is returned to support families at RMH BC. Since 2017, the MHABC has donated over $7,200 to the House! “This is a win-win situation for Ronald McDonald House as well as the MHABC as BC families can continue to access this important resource. At the same time and as we build homes, our Members are able to promote our relationship and financial support for such an important institution,” he stated. Since 1972, the Manufactured Housing Association of British Columbia has been the voice of manufactured home dealers, builders, transporters and many suppliers providing service within BC. They also serve as an information source for the general public, fielding questions ranging from sales and service to technical details on manufactured home construction practices.